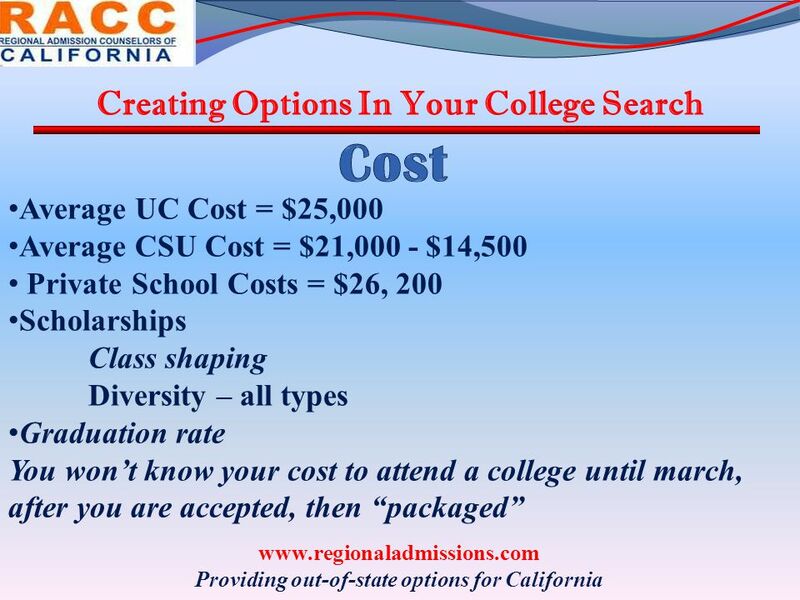 Creating Options In Your College Search www.regionaladmissions.com Providing out-of-state options for California. 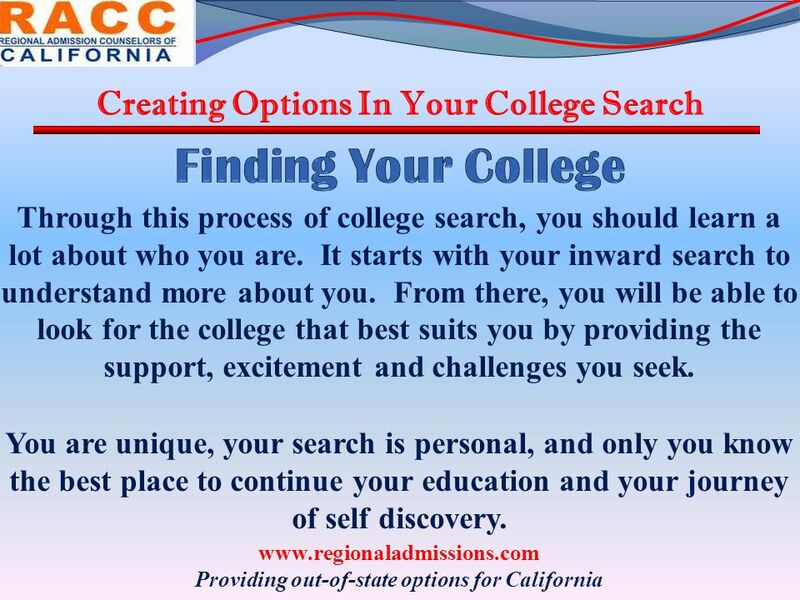 14 Creating Options In Your College Search www.regionaladmissions.com Providing out-of-state options for California Through this process of college search, you should learn a lot about who you are. It starts with your inward search to understand more about you. 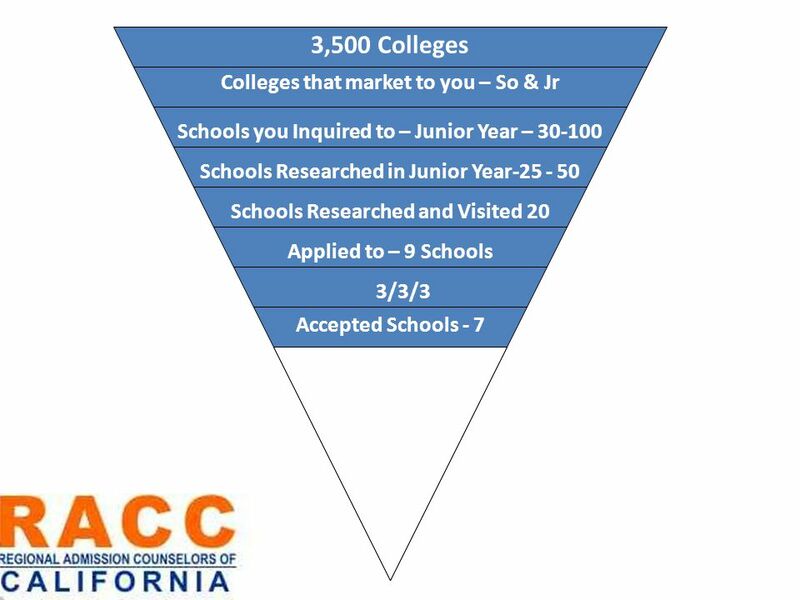 From there, you will be able to look for the college that best suits you by providing the support, excitement and challenges you seek. You are unique, your search is personal, and only you know the best place to continue your education and your journey of self discovery. 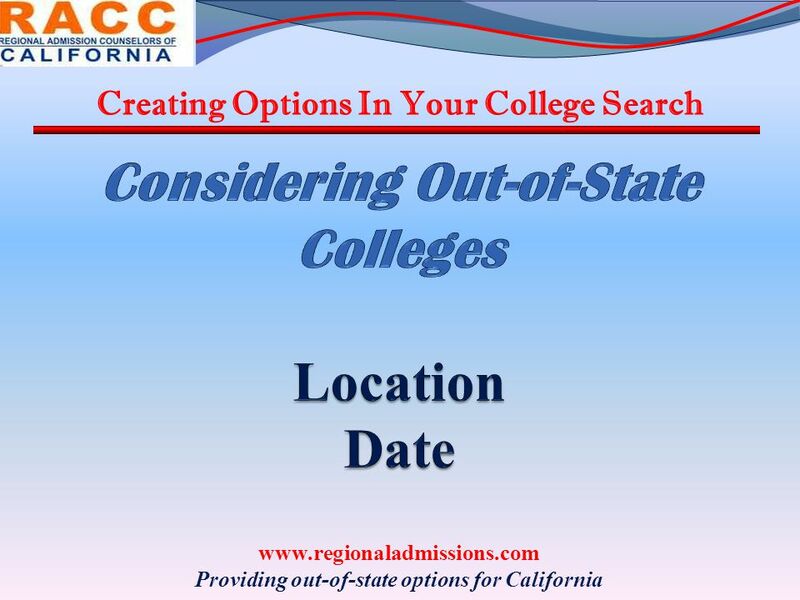 15 Creating Options In Your College Search www.regionaladmissions.com Providing out-of-state options for California The three tiered list should include 9 colleges total. 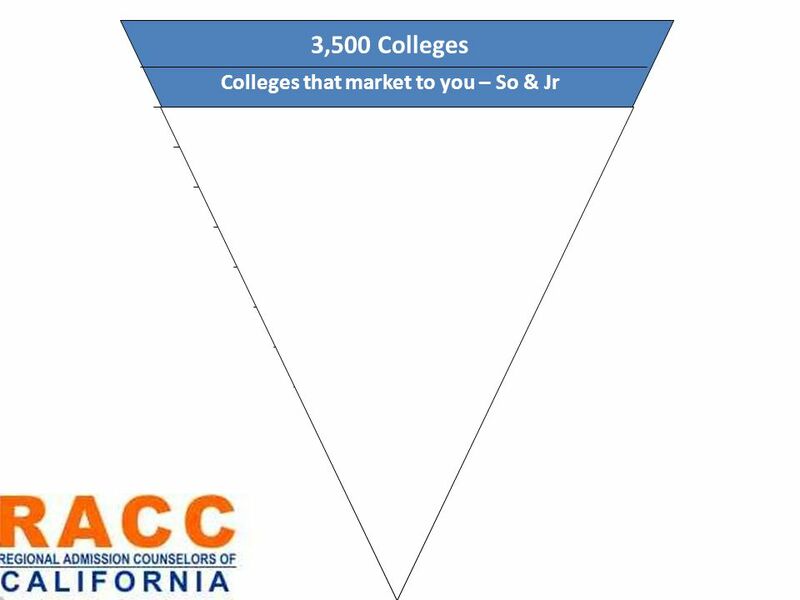 3 Reach Colleges – Your academic record is slightly below the average admission profile from last year, but you have something extra to offer – outstanding leadership, community service, extra-curricular activities, portfolio, awesome essay, unique major, etc. 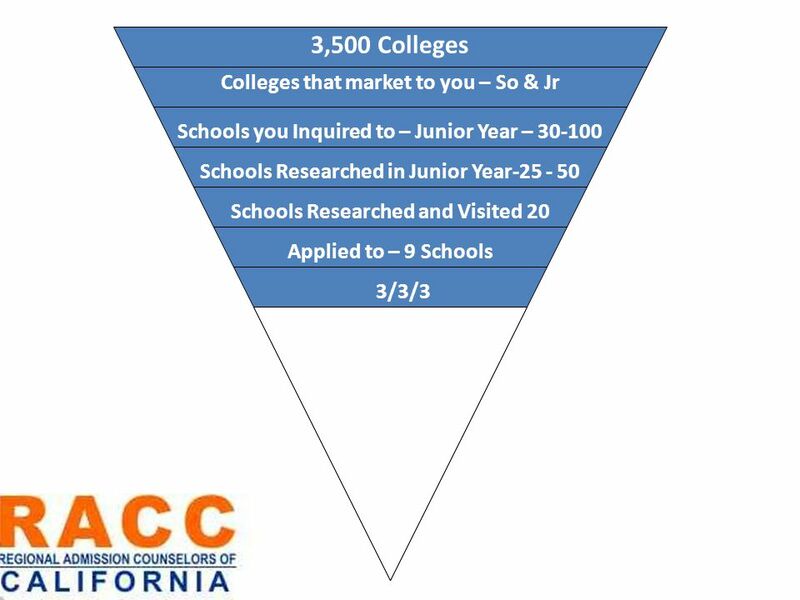 3 Good Chance Colleges – Your academic record is at, or above, last year’s admission profile. 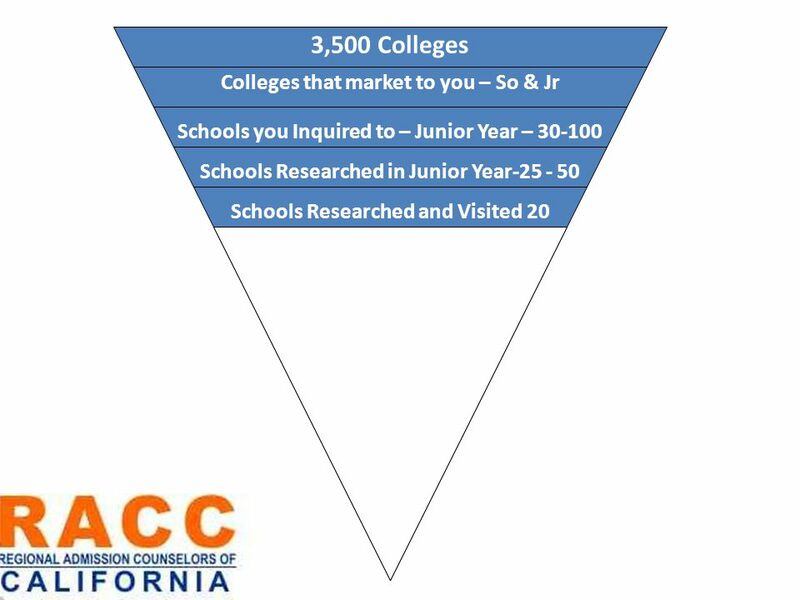 3 Definite Colleges – Your academic record is well above last year’s admission profile. AND YOU LOVE THEM ALL! 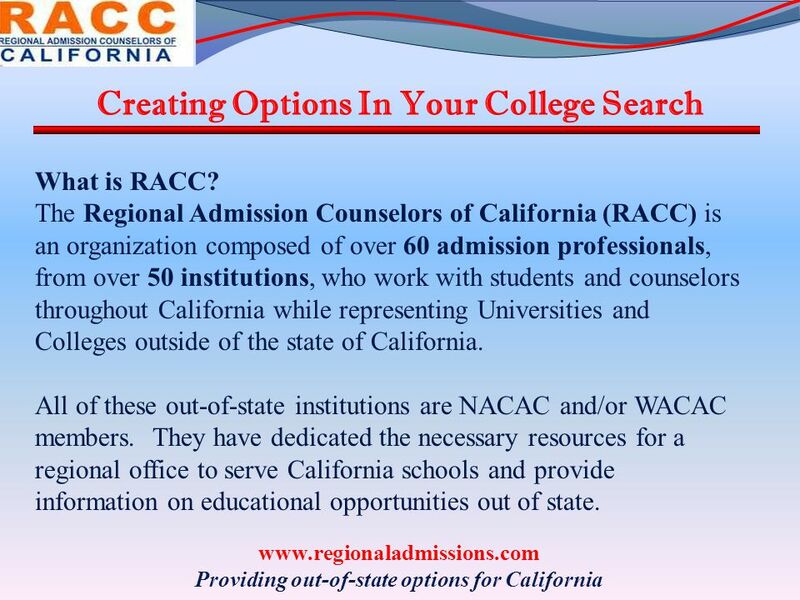 31 Creating Options In Your College Search www.regionaladmissions.com Providing out-of-state options for California What is RACC? 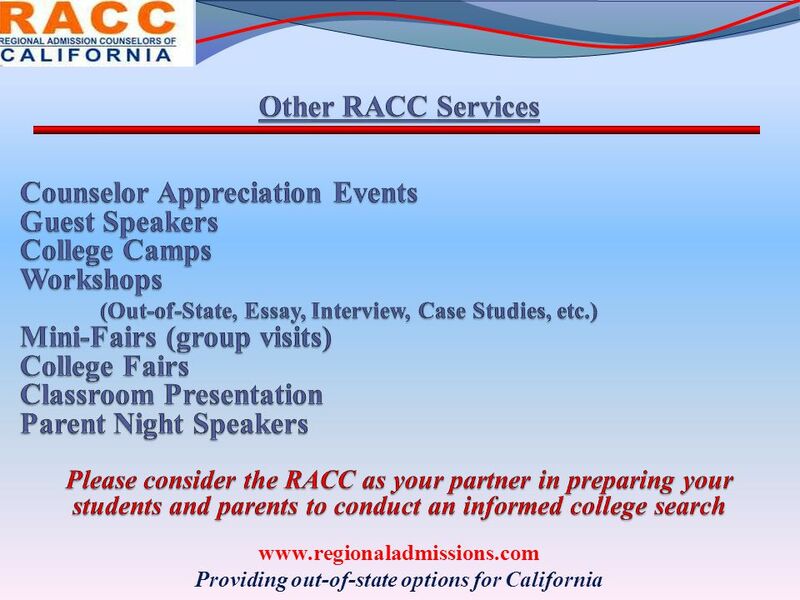 The Regional Admission Counselors of California (RACC) is an organization composed of over 60 admission professionals, from over 50 institutions, who work with students and counselors throughout California while representing Universities and Colleges outside of the state of California. 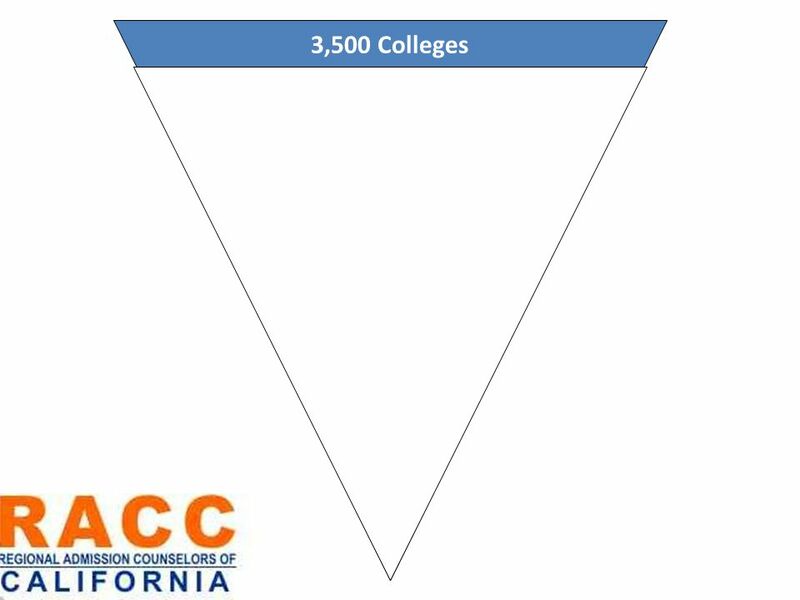 All of these out-of-state institutions are NACAC and/or WACAC members. 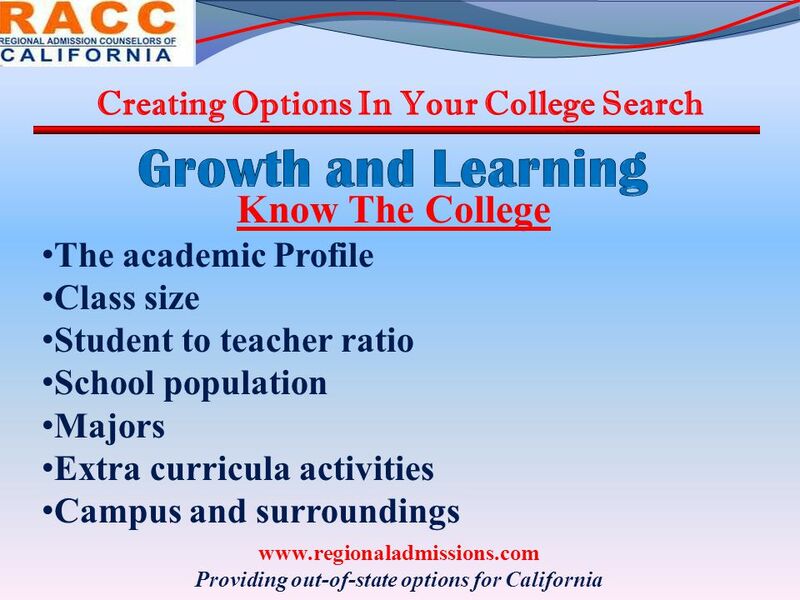 They have dedicated the necessary resources for a regional office to serve California schools and provide information on educational opportunities out of state. 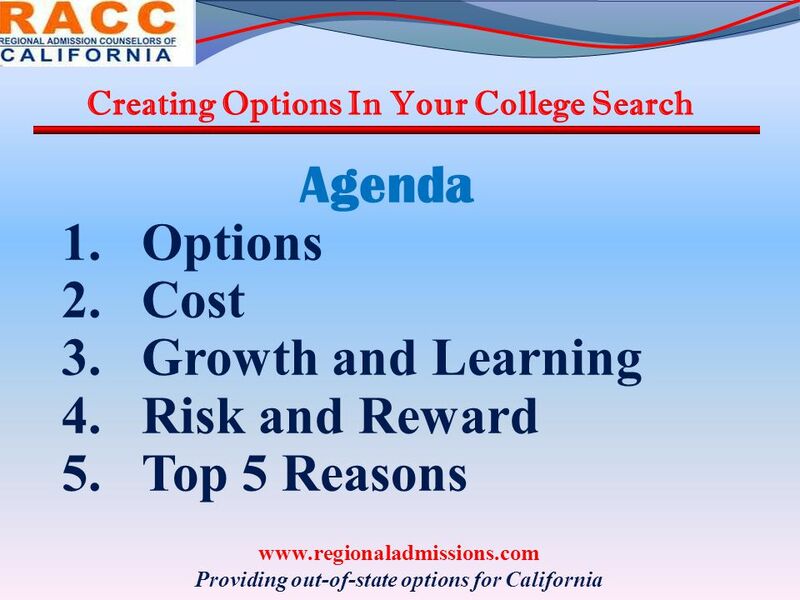 Download ppt "Creating Options In Your College Search www.regionaladmissions.com Providing out-of-state options for California." 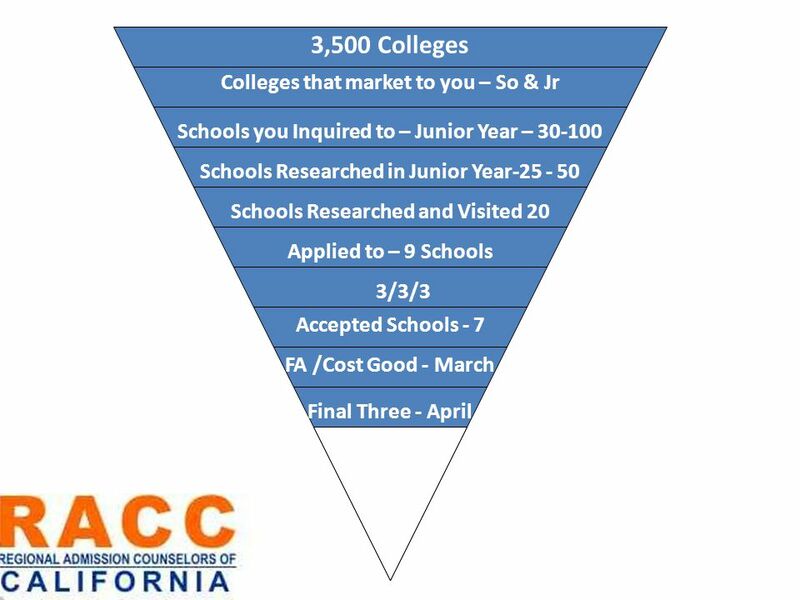 An Overview of the Financial Aid Process Financing Your Childs College Education. 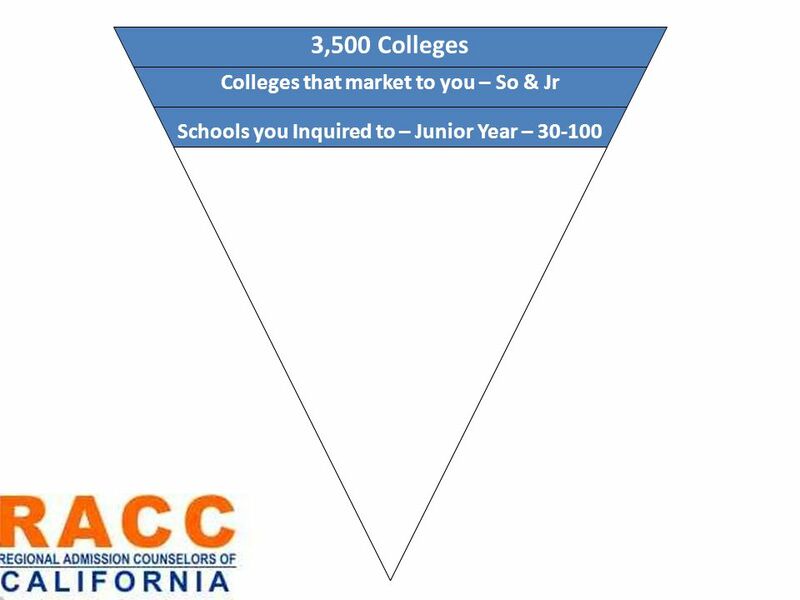 So, You Want to Go to College? Where are you going? 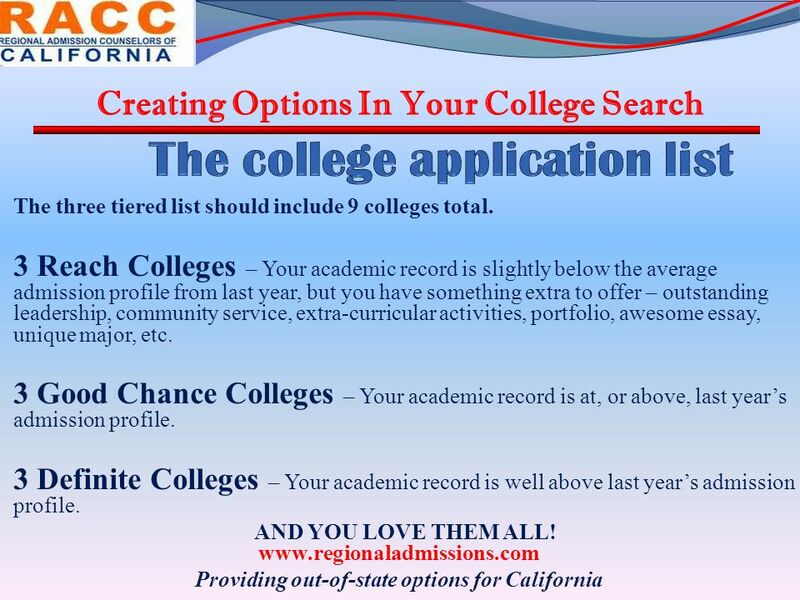 High School Community College University of California Independent Colleges California State University. 1 GET SET FOR © 2010 by ACT, Inc. All rights reserved. College. Presented by the Guidance Department Junior Workshop. 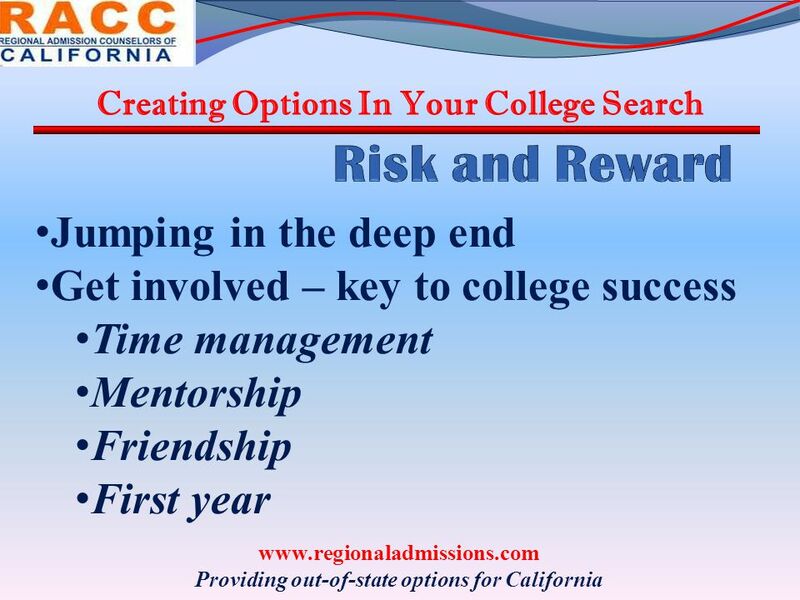 College Night Presentation for Juniors and their Parents. Planning for College Kim Gentile The University of Akron. 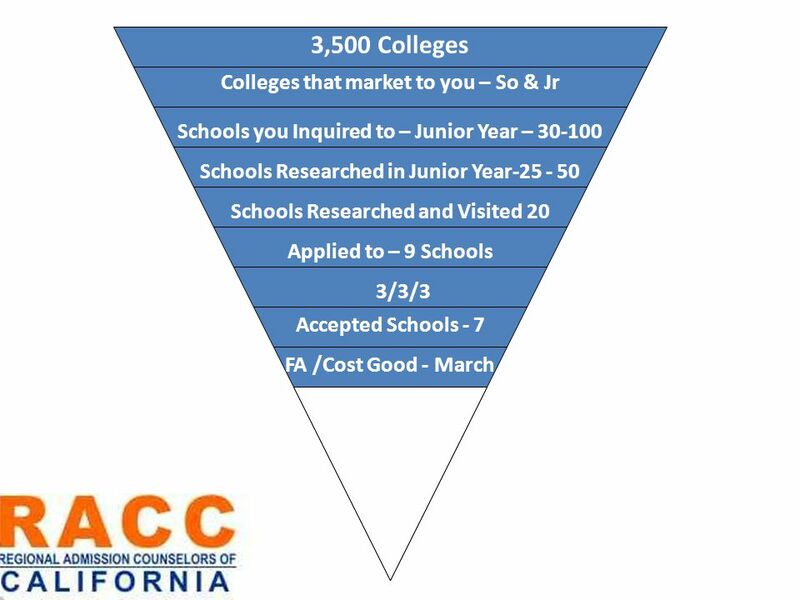 Investing in Your Future. 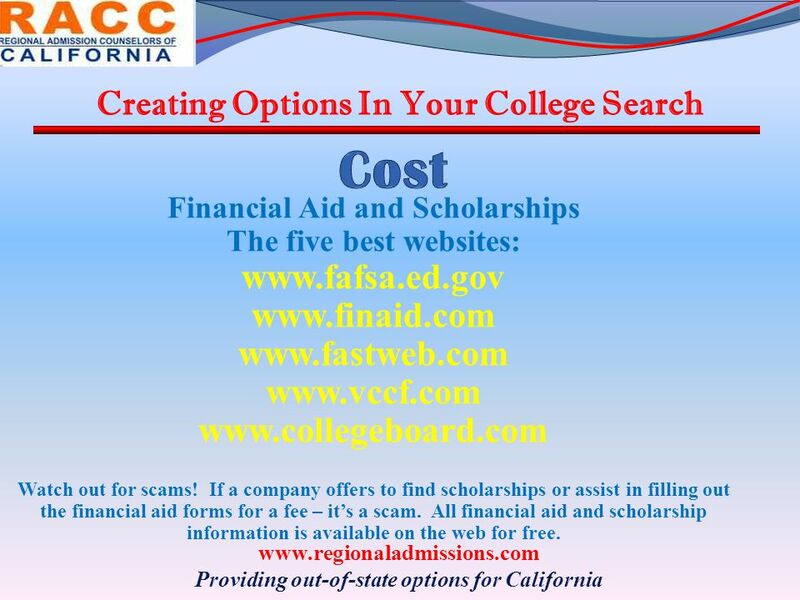 Workshop Agenda The Financial Aid Equation The Basic Formula Types of Financial Aid Scholarships, Grants, Work-Study & Loans. Senior Presentation Senior Presentation. 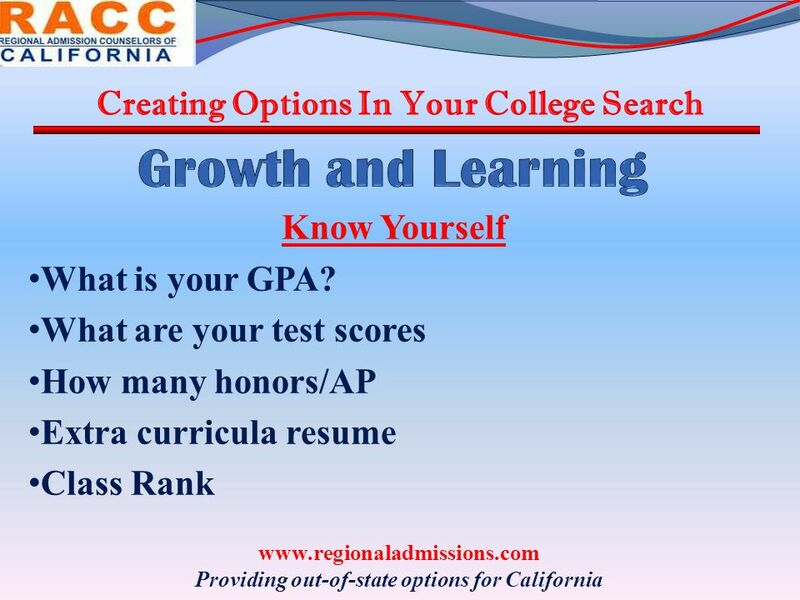 Graduation Requirements Must Pass Reading and Writing HSPE Must Pass Reading and Writing HSPE Must Pass one Math.  It’s time to make some decisions.  Technical College? 2-Year College? 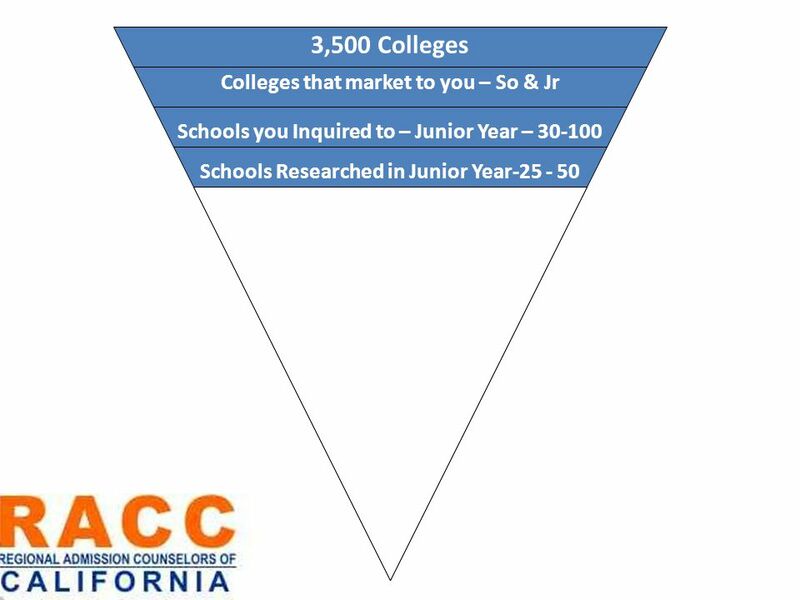 4-Year College?  Safety School? Stretch School? What’s the difference?  What. 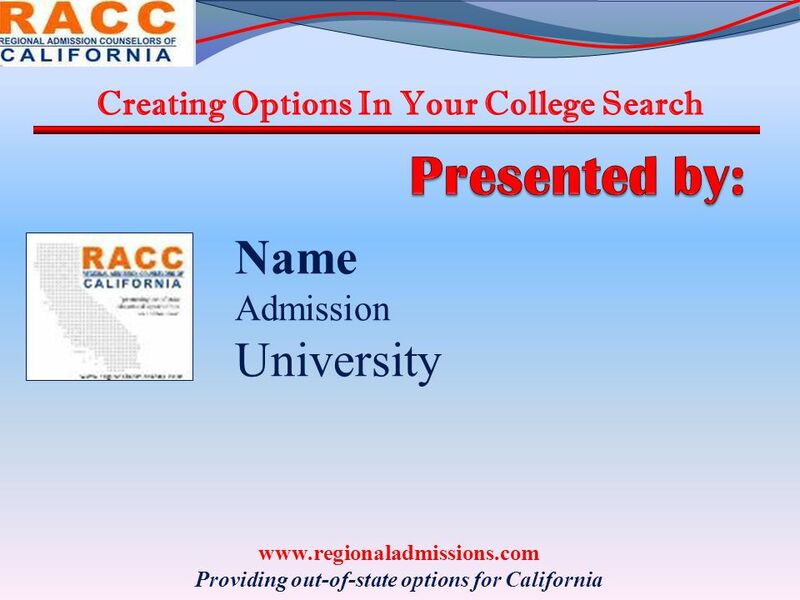 Parent/Student Meeting September 17, 2012 COLLEGE PLANNING. Welcome to Senior Parent Night!!! Marilyn Palomino- AP Guidance John Volo - Activities Director Karen Collison- School Counselor Erika Enz- College/Career. 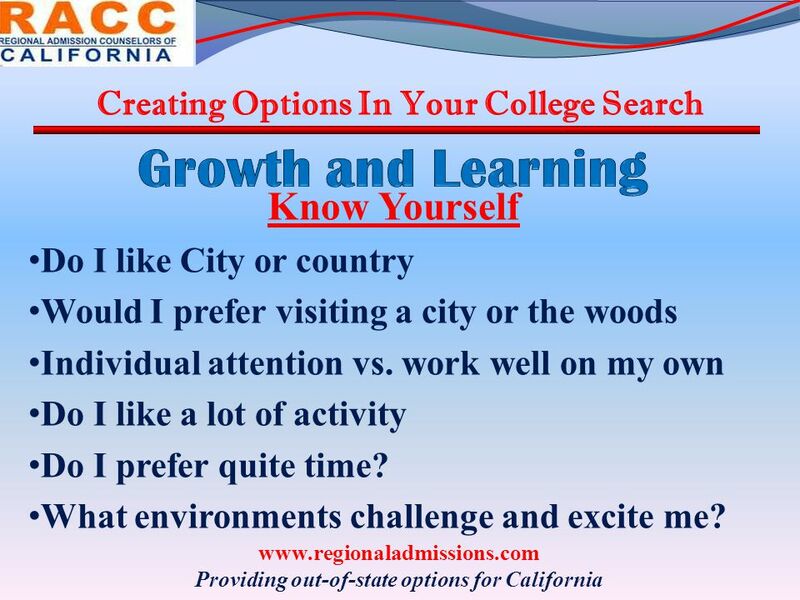 Going to College? Prepare to take the Next Step! Jason Howard Associate Director Ohio University Zanesville *Presentation adapted from ACT: Planning for. Student Services Department Riverside Brookfield High School August 20, 2014. 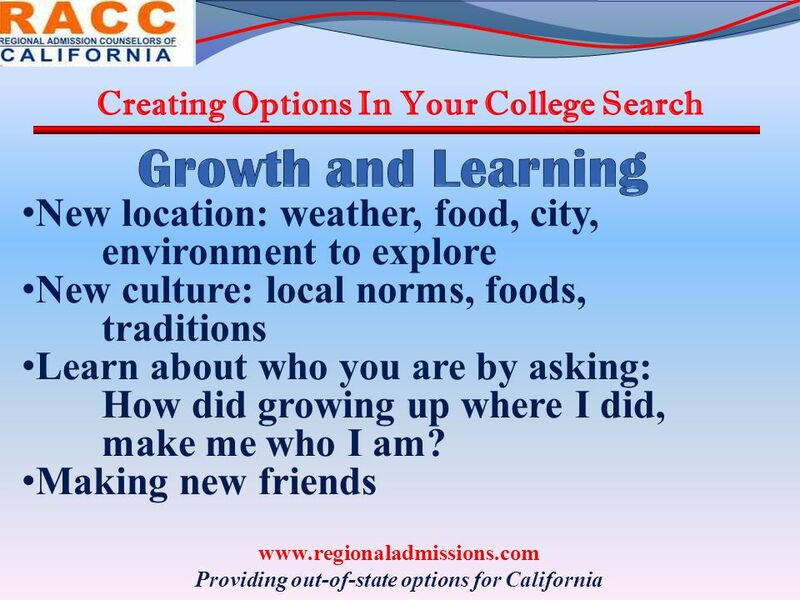  What To Do Before Completing Applications  Your Immediate Responsibilities  Parts of the Application  Counselor Responsibilities  Deadlines  Financial. SENIOR PARENT NIGHT …or how I survived my child’s Senior year! 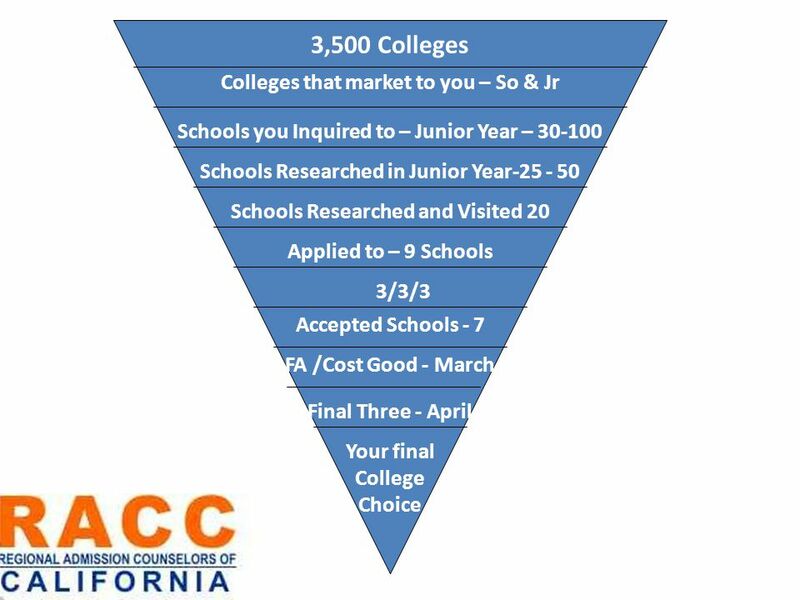 Understanding College Options: Benefits, Pathways, and Preparation.